Wish you could get your cholesterol—and your risk of heart disease—to take a dip? Good news: You can, with just a few dietary changes! Thanks to the folks at Benecol® for sponsoring this blog post. All opinions, as always, are my own. You may have heard about plant stanols and plant sterols. These are both phytosterols, naturally found in small amounts in foods such as vegetable oils (like canola, sunflower, and olive oil), cereal grains (such as corn and rye), and nuts (like peanuts and almonds). They’re also in smaller amounts in avocado and fruits and vegetables like apples, banana, broccoli, cauliflower, and carrots, per a study in Atherosclerosis. These phytosterols possess a super power: They hold a similar molecular shape to cholesterol, allowing them the ability to compete with cholesterol for absorption in the intestine. This is how they may help lower levels of cholesterol in the blood. And when you lower cholesterol levels, your risk of heart disease also decreases. Although both plant stanols and plant sterols and are beneficial for helping cholesterol levels, the former may hold the upper hand and are believed to be most effective in helping to decrease both total and “bad” LDL cholesterol levels, per a review study by Canadian researchers. Just how many phytosterols do you need for the biggest benefit? Research shows this amount to be 2 grams daily—although most people following a Western diet only naturally take in about 0.3 grams of plant sterols and up to 0.004 grams of plant stanols daily, per research. I recently tried Benecol®, the only buttery spread to offer plant stanols. Two Tablespoons of the spread contains that recommended 2 gram daily amount. You may have seen or tried an earlier version of the spread that contained a lower amount of plant stanols—and also, unfortunately, trans fats. But the folks at Benecol® have worked hard to reformulate the product into the version you see today. It contains an effective amount of plant stanols and no trans fats. Bonus: If you’re already taking a statin to help control your cholesterol, adding a plant-stanol-containing product, such as Benecol®, to your daily diet could help to further lower both your total and LDL cholesterol, shows research in The American Journal of Cardiology. 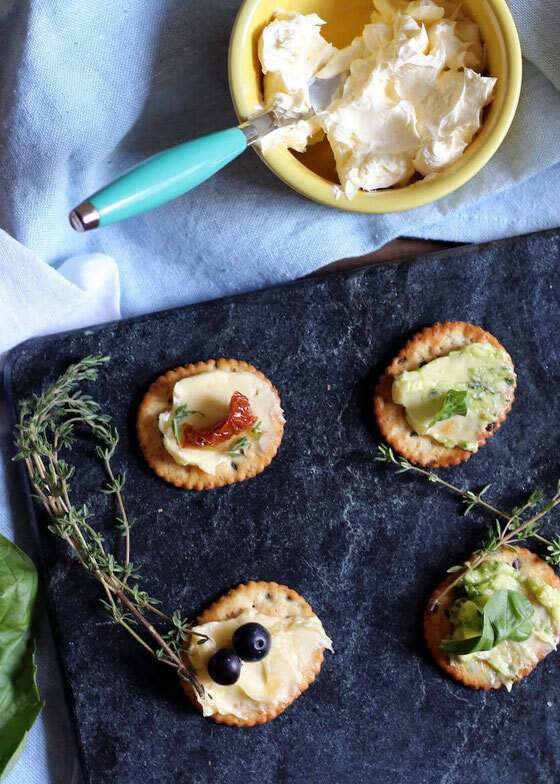 I had a lot of fun playing around in the kitchen with these buttery spreads! 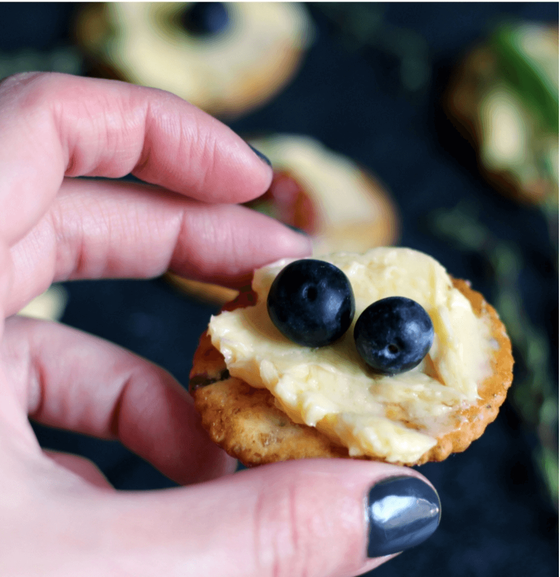 Benecol® has both an original and a light version, and they’re both delicious—especially on top of whole-wheat crackers or whole-grain bread. I definitely know what I’m going to whip up next time I entertain! I made a few easy-to-prepare ideas with the spread, and I’m excited to share them with you. 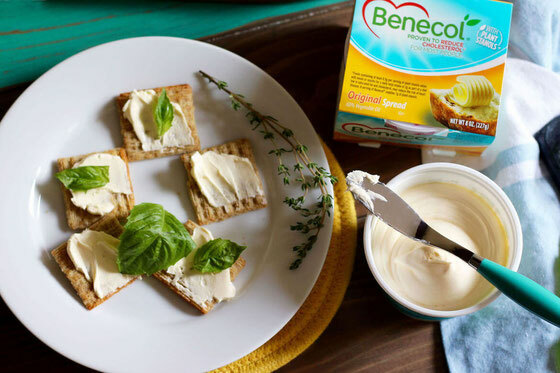 I spread Benecol® on whole-grain crackers, using fresh basil and thyme as finishers. This took just seconds to prepare. 1. Honey Buttery Spread: I stirred 2 teaspoons of honey into 2 Tablespoons of Benecol®. I topped whole-wheat crackers with the honey mixture, plus a couple of blueberries. 2. Basil Pesto Buttery Spread: I mixed 1 teaspoon of pesto into 2 Tablespoons of Benecol®. I spread the mixture on crackers, topping it with fresh basil. 2. 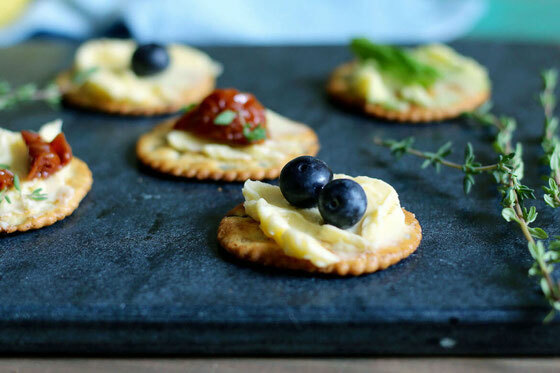 Sundried Tomato and Thyme Cracker: I spread plain Benecol® on crackers, topping it with pieces of olive-oil-packed sundried tomato and fresh thyme. 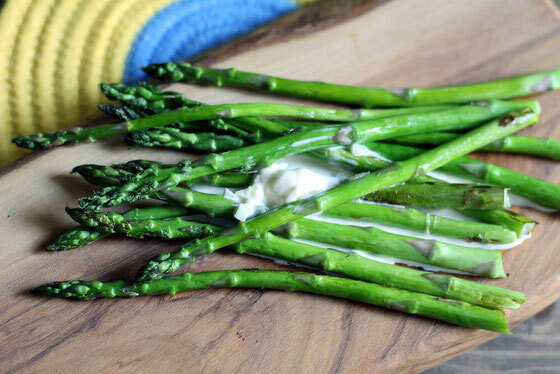 You could do this with pretty much any vegetable, but I chose asparagus: I pan-fried the green veggie, cooking it with just a little bit of grapeseed oil. I minced two cloves of garlic, then added that to two Tablespoons of Benecol®. 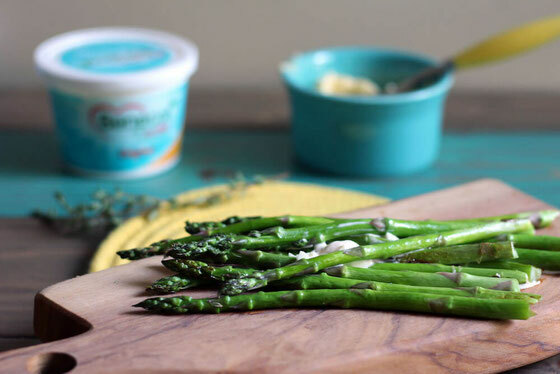 I topped asparagus with the garlic buttery spread just after it was finished cooking. You can use Benecol® as a sub-in for butter or margarine in many recipes, from muffins to quick breads to pancakes. 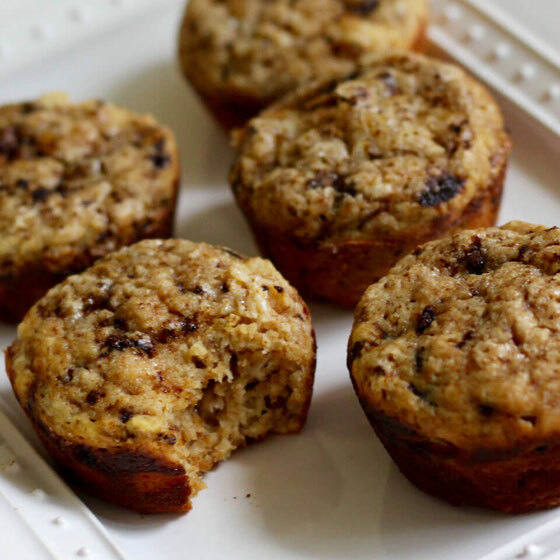 I recently whipped up a batch of these Coffee Cake Muffins with the buttery spread. The muffins were delicious! What are your thoughts on this topic? What other ideas do you have for cooking with a plant-stanol-containing spread? What are your favorite ways to eat to lower cholesterol?